Obituary for Charles Carmine Marshall, Esq. Charles C. Marshall, Esq. 74, lifelong resident of Rutherford, passed away on Thursday, January 31st, 2019. He was born in Jersey City to Charles Tilger Marshall and Teresa (nee Aumenta). Charles graduated from Rutherford High School in 1963. He earned his undergraduate degree in Engineering from Fairleigh Dickinson and his law degree from Seton Hall. During his law career he was in private practice in Rutherford and later worked for CNA Insurance Co. He was the Municipal Court Judge for the Borough of Rutherford from 1984 to 1992. 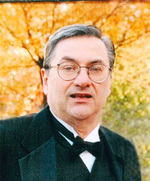 Charles was an active member of the Rutherford Congregational Church since 1976 and past President of Church Council, member of the Rutherford Lyons Club and President of Chamber of Commerce. Charles will be deeply missed by his devoted and loving wife, Carol (nee Leitner) and his daughter Nora Esposito and husband Joseph. Family will receive friends Wednesday 4pm to 8pm in the Calhoun-Mania Funeral Home, 19 Lincoln Ave., Rutherford. Funeral Service Thursday, all to assemble 11am in the Rutherford Congregational Church, 251 Union Ave., Rutherford. In lieu of flowers the family of Charles would appreciate donations to the Rutherford Congregational Church, 251 Union Avenue, Rutherford NJ 07070.